The importance of global expansion in the manufacturing industry cannot be overstated. We recently sat down with Matt Recko, Manager of International Business at Tremco to discuss his role and the department’s overall international initiatives. Q. Can you tell us a little bit about your role and the initiatives of the department? A. As a department, we are currently focused on Australia, India, and Latin America. We aim to establish international partnerships that can be genuine and sustainable. We also work closely with several of our inter-company RPM friends. Overall we have much interest in expanding into many new markets throughout the world. Q. What are some of the challenges you face when working with international companies? A. There’s a culture and language barrier. I speak Spanish, well, I’m trying to become more fluent in it, haha. It's important to hire from within the country so that our friends can help us understand the native culture and business relationships. We’ve also learned that there are differences in construction - the opportunities for product applications here in the U.S. might be different than anywhere else. For example in Vietnam, we learned that if you dig 5 feet in the ground, you hit the water table right away, which is the Saigon River in Ho Chi Minh City. International construction creates challenges but we want to provide solutions. Q. You were recently in Bogotá, Colombia training local architects, contractors, etc. on some of our products and applications. Can you speak to how this was organized? A. The planning for this training took approximately 4 months. We had an agenda and list of action items every month. It was important to make sure that we had the right people as part of the planning and on-site when the training dates came – which highly involved technical support. Q. Since this was our first international training (with many more to come), what did you enjoy the most about this opportunity? A. Definitely seeing the needs and demands of the market and meeting the people. When you travel to an international company, you assume the market is the same, but it’s not. You can have conversations on the phone, but traveling there and speaking with the people gives you the ultimate answers you need. 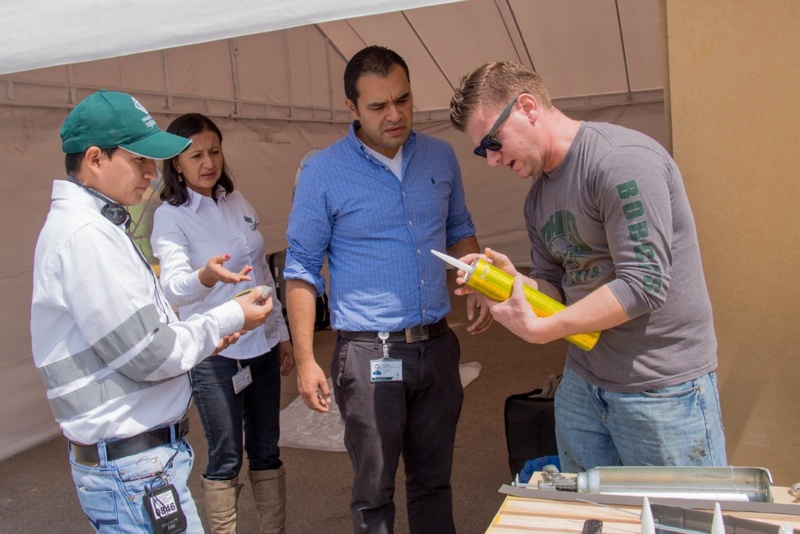 Matt Recko (far right) shows Tremco's Vulkem® 45SSL to contractors in Bogotá. A. Learning different cultures, I love it, I love traveling. This past year, I was in the Philippines in May, Vietnam in August, and Colombia in January. It’s not a vacation, you work 12 hours a day but I enjoy it. You have to enjoy traveling and learning different cultures if you want to work in the international field or have an impact on the progress and success of the business. Matt continually stressed the importance of adaptability when it comes to working in the international market. “You can have assumptions but when you travel to an international country, you realize that those assumptions aren’t 100% accurate. You figure out the market, the demand and supply, expectations, and how you can build a relationship,” said Matt. See below as Matt speaks on his experience training in Colombia. For a complete list of training videos that were captured during this experience, click here. For inquiries or questions regarding our International Department, please contact Sam Appiah at sappiah@tremcoinc.com, Vice President of International, or Matt Recko at mrecko@tremcoinc.com.